Chairman of Research Center for Climate Change University of Indonesia. After finished his Master of Science (1986) and Doctorate degree (1991) from the University of New Mexico, USA, plus pre and postdoctoral at Columbia University in New York, he serves Senior lecturer at the Biology Dept., Director of Biodiversity and Conservation Studies, Coordinator of Graduate Program on Conservation Biology of the University of Indonesia. He also became a chief editor of Tropical Biodiversity since 1992, Editor of Asia Primate Journal (2008), Board of editor of the International Journal of Wildlife Policy and Law, board of editor of Tropical Ecology, Consulting editor of Biosphere Conservation and board of Advisor of Earthwatch Institute (2002). He also served a member of the board of supervision of Bornean Orangutan Survival Foundation and board of the member of Biodiversity and Development Foundation. In 1999, he served as Chairman of Indonesia Biologist Association, Jakarta Chapter. In 2006, elected President of South East Asia Primatologist Association, and in 2007 assigned as Chairman of IUCN-SSC PSG South East Asia. He has also been an active member of several international organizations: IUCN-World Conservation of Protected Area, IUCN-Specialist Survival Commision-Primate Specialist Group, International Primatological Society, Society for Conservation Biologist and many others. 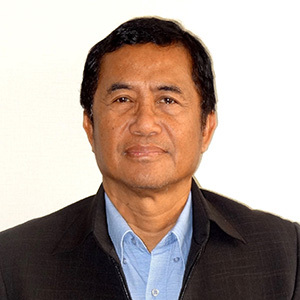 He served several assignments by the Government of Indonesia, member of National Research Council (Dewan Riset Nasional) from 1999-2004, member of Steering Committee on Biodiversity Action Plan at the Min. of Planning (BAPPENAS), Chairman of Biodiversity Taskforce at Min. of Research and Technology (2001-2003), member of Min of Forestry Task force to review logging concession in Indonesia 2003-2005. He has been assigned by Government of Indonesia to be a member of Indonesia delegation to many conferences such as Convention of Biological Diversity, IUCN meeting, World Park Congress, UNFCCC and its SUBSTTA (Bali, Cairns, Bonn, Bangkok) and UN Forest Forum in New York. He is recently active in climate change negotiation for REDD+. For his dedication at the conservation and environment works, he received a distinguished award from his Royal highness Prince of Berhard of the Netherland in 1999 as an Officer of the most Excellence Order of Golden Ark Award. In 2009, he also received the most privileges Award from President B.J. Habibie, or Habibie Award for outstanding achievements on Natural Science research in 2008. In 2011 He also received Achmad Bakrie Award for his contribution in the field of science in Indonesia. He published 9 books mostly in the Indonesia’s Biodiversity and environment and more than 100 articles in the international journals (Science, Nature, Conservation Biology, Primates, Evolution, Primate Conservation, Herpetologica, many others). Two of his books, Biologi Konservasi (Conservation Biology 2007) and Menyelamatkan Alam Indonesia (Saving of Indonesia’s Nature 2009) are among the best seller on the environment books in Indonesia. In 2009, together with Dr. Sharon Gusrky authored an edited book “Indonesia Primates” published by Springer, New York. 2015 Development in Eastern Indonesia: Are There Alternative Approaches?